See that drop right in the middle? Oh mama mia… that’s perfect. That’s Cafe Latte flavored Gelato. Yup, you heard me. Gelato in hot chocolate. 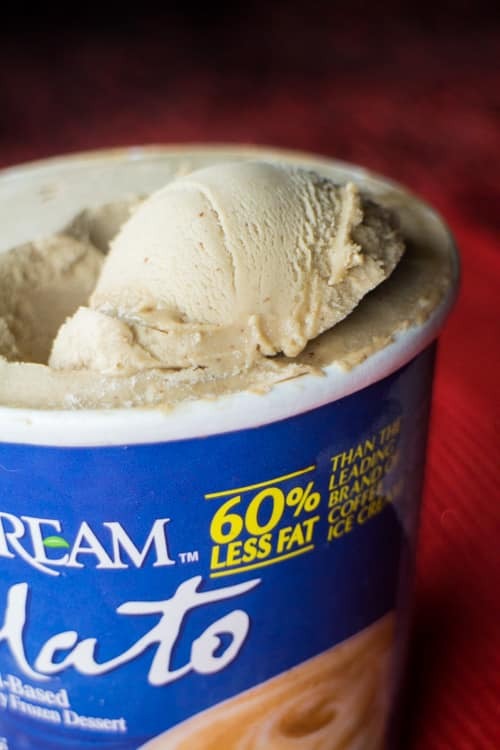 DREAM™ Gelato is the first (and only) almond-based, non-dairy gelato. I just recently found out there is a almond factory 2 blocks away from me so everyday I insist in walking by it so I can smell the sweet almonds. The small things in life.. you know? 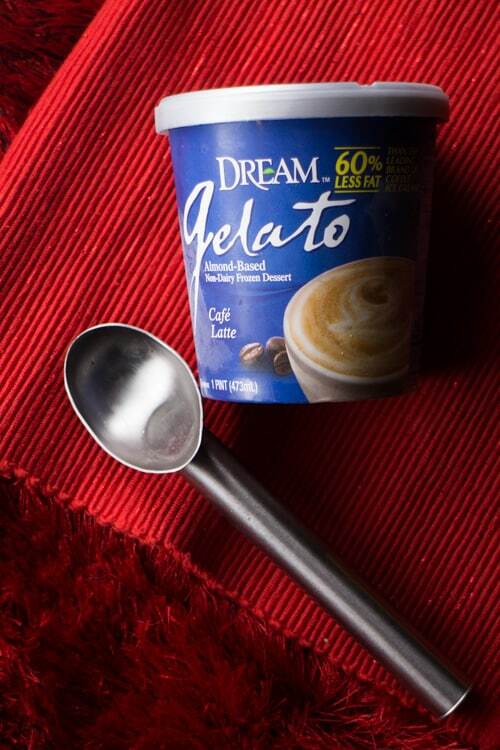 Made in the traditional Italian style from real almonds, DREAM™ Gelatos are vegan, free of artificial flavors and preservatives, free of highly refined sugars, and free of lactose, gluten, cholesterol, and trans fats. Basically, it wins. 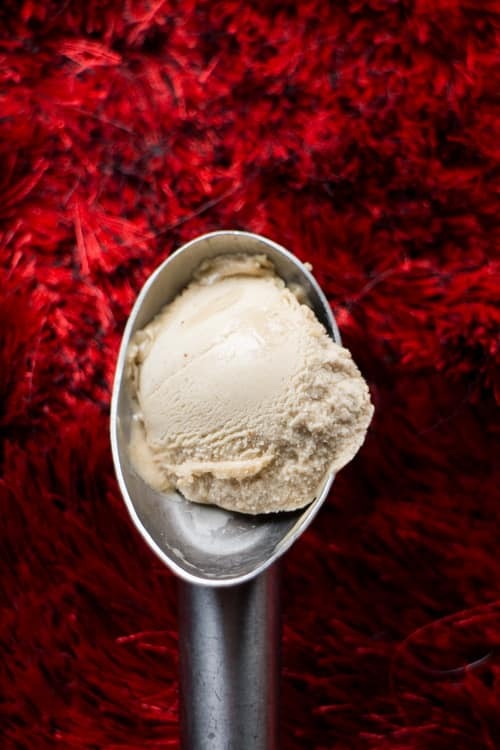 It comes in 8 flavors: Sea Salt Caramel, Chocolate Indulgence, Café Latte, Coconut Almond, Tropical Mango, Raspberry Ribbon, Black Cherry and Vanilla Bean. 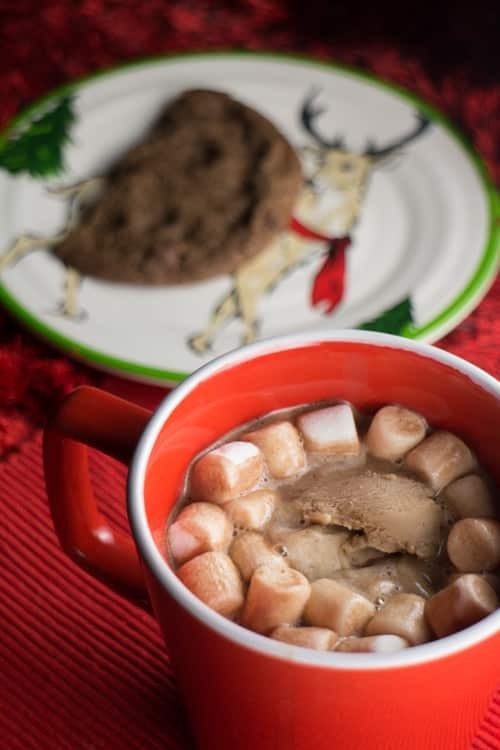 Seriously, can you imagine a hot chocolate with Sea Salt Caramel Gelato in it? 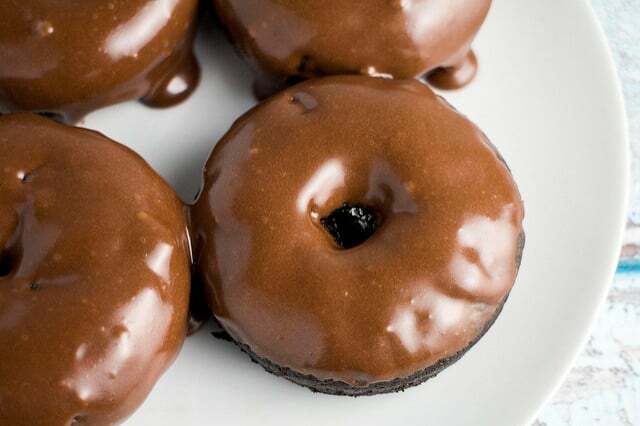 Or how about making it extra chocolate with Chocolate Indulgence (title of my future biography)? If you see them in the store, you must pick them up to try! Put milk, cocoa powder and sugar in small saucepan over medium high heat. Continue mix until it is warm. 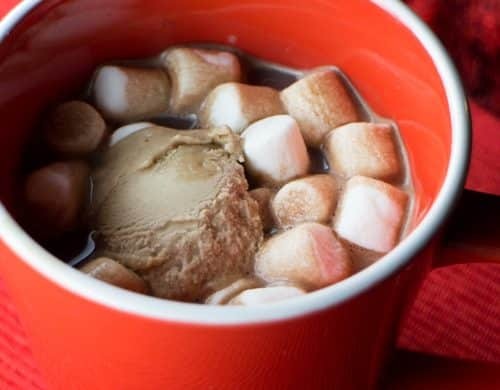 Pour into mug and add in a bunch of marshmallows. Add 1-2 scoops of Café Latte Gelato on top. This is the recipe for 1 serving. Duplicate for how many you need. Make sure to visit the DREAM™ Facebook page to learn about fun recipes and new products. This is a sponsored post written by me on behalf of DREAM™. 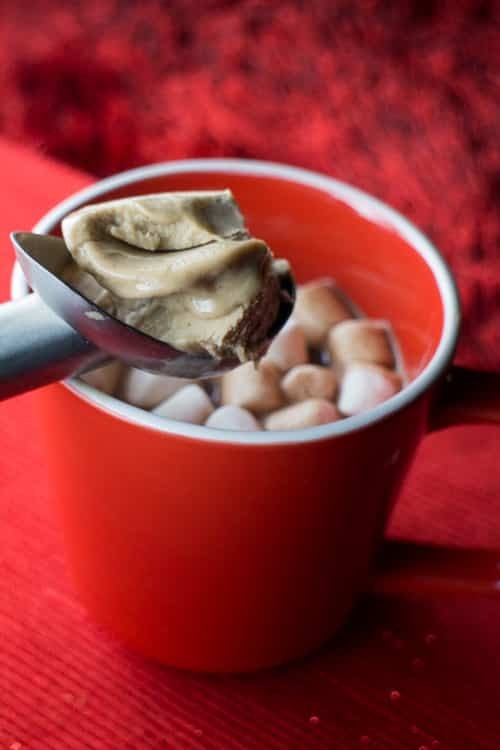 I need this to warm me up.. I’m a marshmallow fan too! 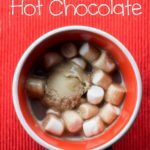 Pamela – you are so right – hot chocolate has a magical way of cheering me up too! I think this gelato laced one might just have me euphoric! 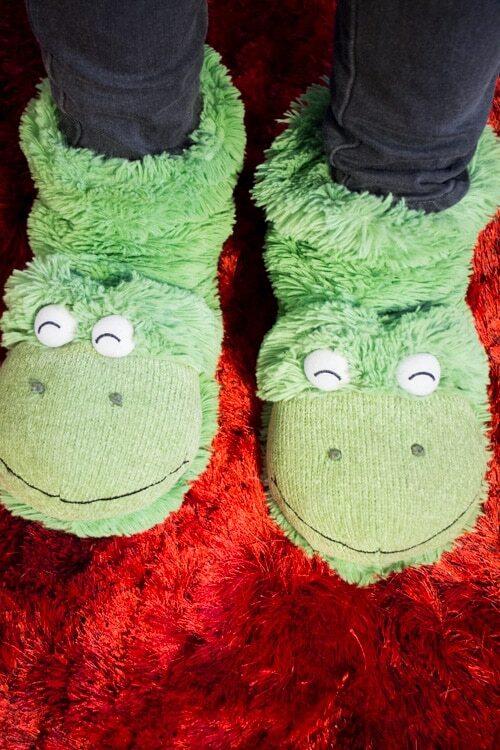 Love those frog slippers! 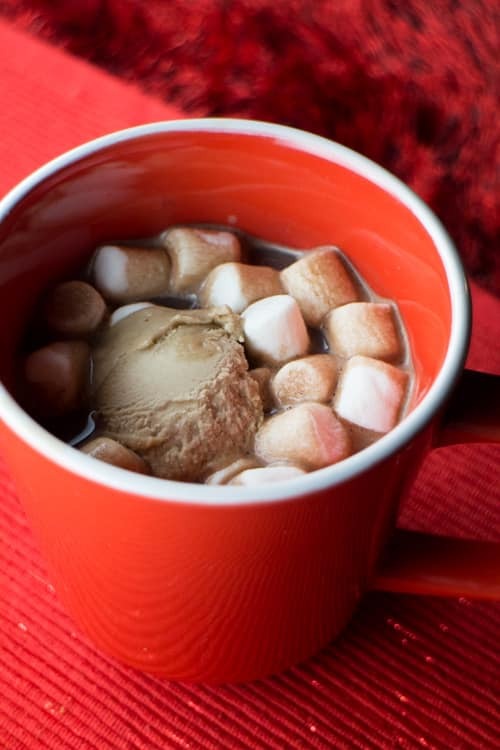 And love those marshmallows — can’t have hot chocolate without marshmallows. And speaking of hot chocolate, I haven’t had it for ages, and you’ve put me in the mood for it. Really nice! Thanks. Hi Pamela, Oooo! I love gelato and hot chocolate, this looks like a marriage made in heaven! I love the hot hot chocolate with that scoop of ice cream. I add ice cream to my egg nog too! Looks yummy!! Hot chocolate always cheers me up too! This looks soooo good. Why have I never added gelato or ice cream to my hot chocolate before?? When I grow up, I want to be JUST like you. #creepynotcreepy LOL! I refuse to give up gelato or ice cream during the winter, so this seems like the perfect compromise! A mix of both cold and hot! SO into this. 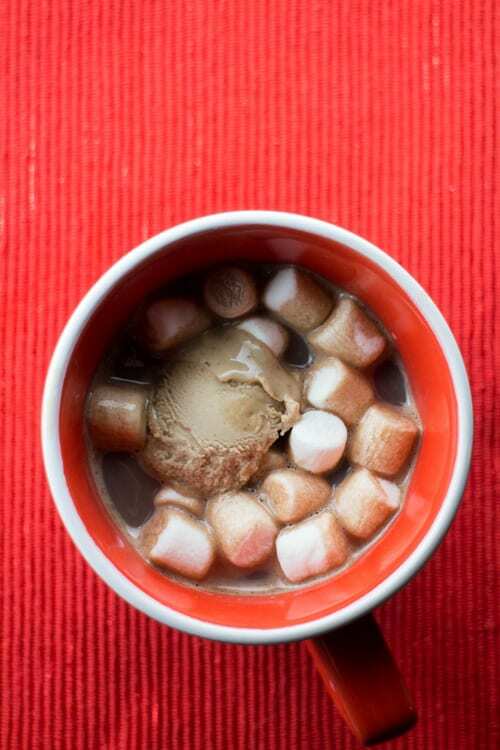 I love gelato, and I love affogato, and I love hot chocolate, and I love marshmallows in hot chocolate. This seems to combine aspects of all the above, beautifully, cozily, and most importantly, deliciously! Why have I never tried this? Seriously? I love a mug of hot chocolate and gelato brilliant 😀 p.s I love those slippers! Those slippers rock! I love them. They look super cozy to go along with the tasty hot chocolate. How did I miss this?? 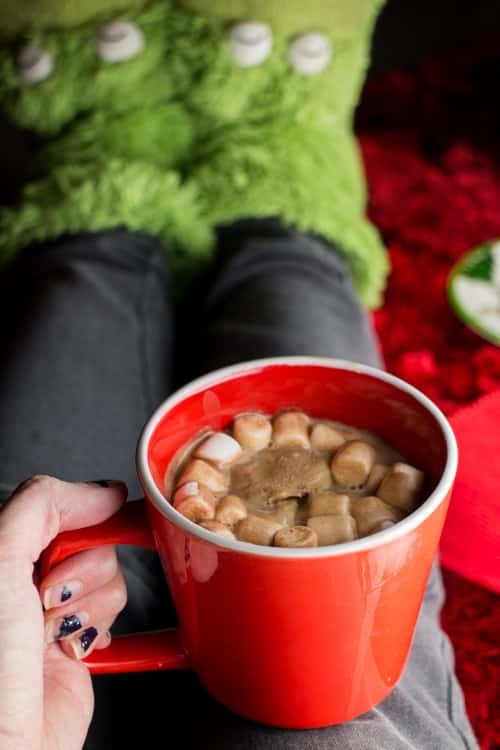 Love the idea of this hot chocolate…and those slippers…too cute! Hot chocolate always has a way of comforting me and making me smile. I love the idea of adding gelato, that sounds amazing! My hot chocolate could definitely use some gelato company! First of all, cute slippers 😉 Second of all, I love the idea of cold gelato in hot chocolate! MMM!